"We walk together, we fall together," says mob kingpin John Gotti to his son in the ridiculous gangster biopic Gotti. In the moment, he's delivering yet another piece of hardened street-wisdom, one of the many bumper sticker-ready koans delivered with an amused smirk by star John Travolta, but he could also be talking about the doomed fate of the low-rent film that surrounds him. Like the Teflon Don himself, the movie has been no stranger to bad press. Unfortunately for the film, the charges against it mostly stick. As of this writing, Gotti has made $1.6 million at the box office and still has a 0% rating on Rotten Tomatoes, a distinction that's rarer than you might assume. With 25 reviews collected, including 14 from "Top Critics," the film doesn't have a single positive review on the site. For some context, recent critically reviled films like Will Smith's fantasy mess Bright or the tedious superhero blockbuster Justice League scored 26% and 40%, respectively. Gotti's brutal 0% showing puts in a conversation with movies like the Adam Sandler Western Ridiculous 6 and the forgotten Eddie Murphy vehicle A Thousand Words. Not exactly an elite club you'd want to join. And the reviews themselves aren't just polite pats on the head. The New York Post declared Gotti "the worst Mob movie of all time," and the headline for Rolling Stone's missive called it "a mobster biopic that deserves to get whacked." In his one-star review for RogerEbert.com, critic Brian Tallerico ended his piece with a note of sadness for the mobster himself, writing "he may have been a murderer, but even Gotti deserved better than this." But is Gotti getting a bad wrap? As soon as the stories about the RT rating started making the rounds, I became curious. Is this thing really as bad as everyone says it is? The idea of a Travolta-led Gotti biopic directed by Kevin Connolly (aka "E" from Entourage) and featuring multiple songs by Pitbull sounds like a throwaway 30 Rock joke. At the same time, maybe it's actually an entertaining movie, like other Rotten Tomatoes failures? The movie opens with Gotti addressing the camera in a move that's clearly supposed to remind viewers of Ray Liotta breaking the fourth wall at the end of Goodfellas. "Let me tell you something," says Gotti before going on to share unique insights like "New York City is the greatest city in the world" and "This life ends one of two ways: Dead or in jail." The version of Gotti that we see in this movie is a chatty, mischievous tough guy. Though he's shown carrying out a hit early in the movie, brutally murdering a man in a bar with a quick shot to the head, the script, which was penned by Lem Dobbs and Leo Rossi, isn't exactly obsessed with Gotti's illegal activities. Many crimes are papered over with archival news footage and newspaper clippings that just reveal how little certain actors resemble their real-life counterparts. Instead, Gotti is more focused on the man's family life, particularly his relationship with his long-suffering wife Victoria Gotti (Travolta's wife Kelly Preston) and his aspiring-boss son John Gotti Jr. (relative newcomer Spencer Lofranco). 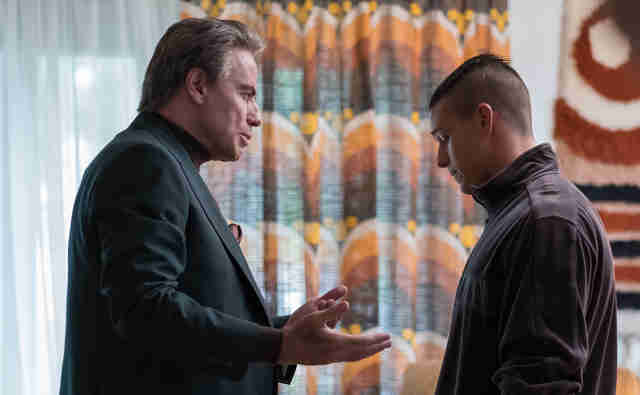 The film itself was inspired by Gotti Jr.'s memoir Shadow of My Father, and Gotti Jr. has been part of the movie's promotional push, so it's unsurprising that the younger Gotti gets presented in a mostly positive light, particularly in the film's closing moments. What's even more surprising is how much affection the film has for Gotti himself: In one hilarious scene, we see Gotti in his role as a BBQ-hosting, cop-belittling fireworks enthusiast. He may have run a crime syndicate, but, really, his passion was bottle rockets. The movie suggests he was a good host, like the Barefoot Contessa of the five boroughs. These moments might not stand out so much if the movie wasn't edited in such a bizarre, disorienting manner. As Connolly pings back and forth from Gotti's time in jail to his rise up through the ranks of the mob, the movie begins to resemble a scrapbook consisting of printed-out Wikipedia articles. We keep seeing new years pop up on the screen as we move through time, and Travolta's makeup and hair change to suggest he's aging, but the scenes rarely feel connected or like they have any bearing on what came before. 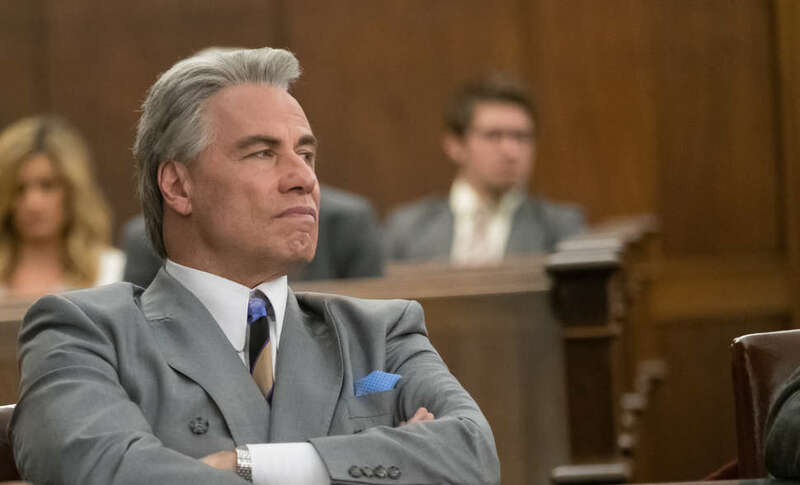 No amount of voice-over or archival footage can make sense of it, particularly as the movie gets bogged down in Gotti's legal troubles. If the movie is so incompetent, what makes it watchable? Travolta, mostly. 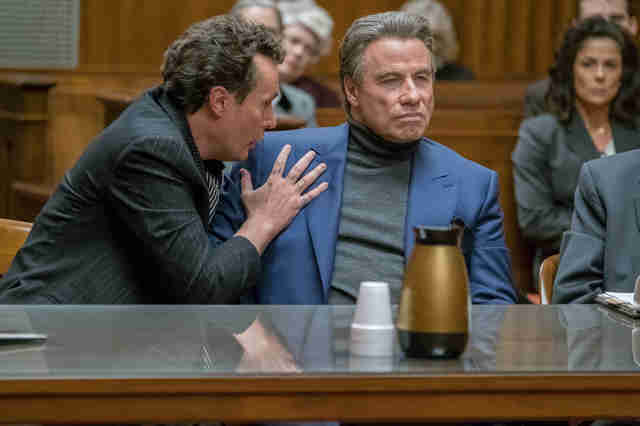 In a parallel universe -- perhaps one where previously announced director Barry Levinson stayed on the project -- Gotti could be considered another chapter in Travolta's ongoing comeback narrative. Thanks to the award-winning (and highly meme-able) success of FX's American Crime Story: The People Vs. O.J. Simpson, which found the Pulp Fiction star playing blustery attorney Robert Shapiro, the actor was once again being celebrated instead of mocked. His performance as Gotti is in the same stylized ballpark as his take on Shapiro, full of odd physical tics and vocal flourishes, but the film lacks the heightened, ironic gloss of a filmmaker like Ryan Murphy. As a director, Connolly gives him little to play off. The Gotti story is a macho soap opera, one packed with tearful betrayals and melodramatic confrontations. There's also a pronounced Trump-ian quality to the narrative, particularly the way Gotti's adoring fans continued to treat him as a folk hero despite the overwhelming evidence suggesting he was unworthy of such praise. These Gotti supporters essentially get the last word in film's closing moments. Given the polarized state of the world, it's likely the film's critical reception will be interpreted in strictly binary terms. The so-called media elites have rejected Gotti, scoffing at the movie's gruff populism, but the "real fans" can see past the "fake news." After all, the audience score on Rotten Tomatoes currently sits at 76%. In that sense, Gotti might be exactly the mob movie we deserve.